After enjoying a fireworks show a few nights ago, I was thinking about how we recognize innovation in the online higher education space and how some of the most brilliant innovations appear effortless at first glance—and yet upon closer inspection, we find they required an immense amount of talent, effort, and leadership. I’ll admit that I’ve loved fireworks ever since I was a little kid growing up in the country. They are colorful and festive. When we watch them together, they make us ooh and aah. Videos and photos never do them justice. You really need to be relatively close to the action to experience the full effect. There’s also the limited, but real, risk of danger even when watching a professional pyrotechnic show. This just adds more excitement to the air. But behind the scenes, there’s an amazing amount of work that goes into manufacturing various types of fireworks and even more into organizing them into a cohesive display that people will enjoy. 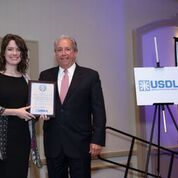 At the USDLA Annual Conference Awards dinner in April, many of the brightest and most hard-working innovators in distance learning were on display. And in a way it was like a fireworks show – well-orchestrated, buzzing with energy, and full of oohs and aahs. And while it’s not possible to recreate the experience, I’d like to take a moment to shine a spotlight on one of this year’s 21st Century Award recipients: Southern New Hampshire University’s College of Online and Continuing Education (COCE). Caption: Michelle Dunn, Communications Director for COCE, is pictured with Dr. John Flores receiving the 21st Century Award on behalf of SNHU’s College of Online and Continuing Education. 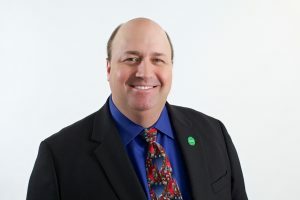 The 21st Century Award is given to an agency, institution, or company that has shown outstanding leadership in the field of distance learning. The award recognizes pioneering organizations in the field that have changed distance learning, challenged existing practice, or developed new and effective solutions. If you’ve been to a national distance education conference in the past 5 years, you’ve probably heard President Paul LeBlanc or Executive Vice President Amelia Manning share news of SNHU’s pioneering efforts to make high-quality education accessible and affordable for all. And I don’t use the term “pioneering” lightly. SNHU was the first university in the nation to be approved for federal financial aid under the U.S. Department of Education’s direct assessment provisions, independent of traditional credit hours. They have built their online programs around the needs of their students, ensuring that higher education can fit into the lives of busy adult learners. While college tuition across the country continues to climb, SNHU College of Online and Continuing Education has held tuition rates across all 200 of their online programs for six consecutive years. As of 2016, SNHU offered one of the most comprehensive and deliberately designed first-year experiences of any online school and continues to refine the experience to ensure learner success. And though SNHU’s light burns brightly, if you visit their website you’ll be hard-pressed to find COCE staff bio pages or strategic planning documents. Instead, you’ll find student-focused communications and educational opportunity within easy reach. But just like a fireworks show, what SNHU’s College of Online and Continuing Education makes look easy demands the characteristics recognized with the 21st Century Award and so I celebrate their well-deserved acknowledgment this holiday week.